The „Columbus Day“ which was first celebrated in the year 1792 on Oct 12 to honor the Italian-American heritage and the so-called discovery of America is due. Once again many schools will pause to commemorate Christopher Columbus, after learning from school books false facts. Given everything we know through historical research about who Columbus was, what he did and introduced in the Americas, this needs to stop. Throughout his years, after his famous first voyage in 1492, when Columbus landed on an unknown Caribbean island in the New World, he enacted policies of forced labor in which natives were put to work for the sake of profits. Columbus sent thousands of peaceful Taino “Indians” from the island of Hispaniola to Spain to be sold. Many died en route. Those left behind were forced to search for gold in mines and on plantations. In an era in which the international slave trade was starting to grow, Columbus and his men enslaved thousands of native inhabitants of the West Indies and subjected them to extreme violence and brutality. Within 60 years after Columbus landed, only a few hundred of what may have been 250,000 Taino were left on their island. Further, the Spanish who remained on the islands used the Taino people as forced labor, punishing them with torture and death if they resisted. 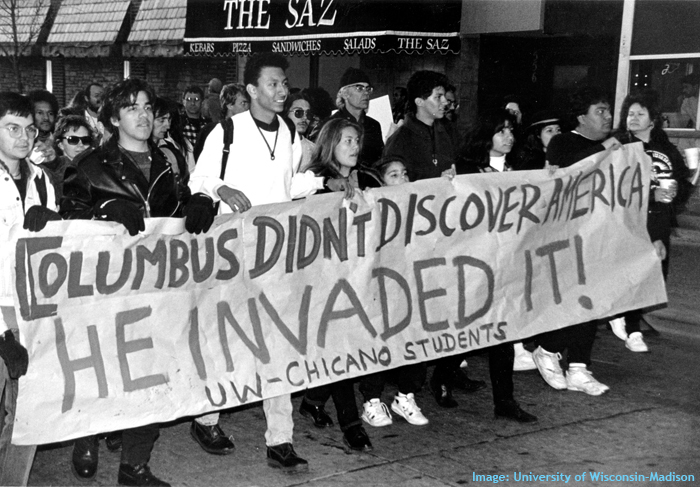 Honoring Christopher Columbus means to overlook a painful history of colonialism, enslavement, discrimination and land grabs that followed his arrival in the Americas. Following the State of Vermont’s proclamation to rename the day, it’s time to abolish „Columbus Day“ everywhere. It’s time to rethink our history, it’s time to recognize the suffering of Native American people endured during American colonization. The least we can do is to call that day „Indigenous People’s Day“.